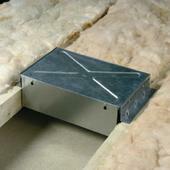 Click Boxes available for ceiling truss of 600mm. Allows free air circulation around the luminaire and provides rigid skin over which insulation can be layed. Accepted by the NHBC. Insulation can now be laid unbroken over the whole floor area as per building and electrical guidelines. Use above flameguard or regular downlights.